What Is Tai Chi & How Is It Taught? Tai Chi is a health exercise for body, mind and spirit. As it is practiced in the west today, Tai Chi can be thought of as a moving form of yoga and meditation combined.The moves are made slowly, softly and gracefully. There are various styles of Tai Chi including Chen, Yang, Sun, Wu Hao, to name a few. Each style may have a different number of moves in its set and the moves may seem similar or dissimilar. We teach Master Moy's modification of the Yang style (called Moy style). It tilizes a 108-move set and emphasizes health benefits rather than martial arts applications. 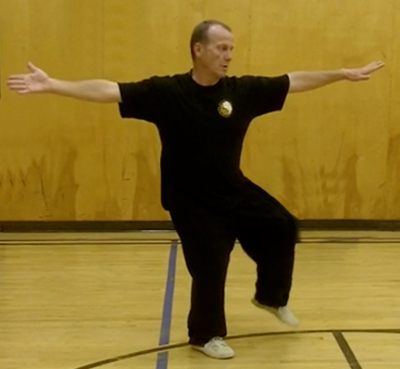 Mr. Moy's form is arguably the most popular Tai Chi form taught in Canada, and it is taught around the world. Tai Chi movements work the whole body in a coordinated fashion that integrates ligaments, fascia, tendons and muscles to improve balance and strength. The conective tissue , joints, bones and circilatry systems are realigned to create proper function of the body as a whole system. A major aim of Tai Chi is to foster relaxation and a tranquil mind through a focus on the precise execution of these exercises. Many people report changes in the pain and inflammation associated with arthritis, fibromyalgia, asthma, and stiff joints. Practitioners often notice a deeper sleep, a calmness through the day and an overall sense of well being. How is Tai Chi Taught? The practice of Tai Chi starts with a beginner's class. Over a period of 6 months, participants meet once or twice a week for a period of 60 to 90 minutes to learn the 108-move sequence that comprise the Moy style set. Between classes they practice on their own. The moves are taught a few at a time with the instructor first demonstrating a move, then with the participants following the instructor, and finally with the participants doing the move on their own. Gentle instructions for doing the moves in correct form are offered during this process. Over time, the moves are strung together and at the end of the introductory class, the participants are doing the entire 108-move set. Because the Tai Chi moves are designed to very slowly and gently build strength, coordination and balance, most people whose physical shape is not good are able to physically handle the initial learning of the form. Over this learning period, participants can expect to experience increased strength, a better sense of balance, and a meditative/relaxation benefit.